Last WEEK’S article looked at some of the brave naval personnel from Chichester who took part in battles at sea during the First World War. This article continues to tell their stories. On June 6, 1916, HMS Hampshire was sunk with the loss of 737 lives. Secretary of State for War, Field Marshall Lord Kitchener, was on board, heading for a diplomatic mission in Russia. On leaving Scapa Flow, Scotland, the ship struck a mine and sank. Stoker 1st Class Harry Noel, Stoker 1st Class Charles Ayling and Able Seaman William Freeman were all killed. William Freeman had attended the Central Boys School and had been in the Navy for six years before he was killed, aged 23. On October 27, 1916, HMS Nubian was torpedoed in the Dover Strait, killing many of those on board. Petty Officer Stoker James Rapson was one of those killed. He is buried in Chichester’s Portfield Cemetery. Trimmer George Scutt was a member of the Royal Naval Reserves and served on HMS Evadne, a mine sweeping ship. He was killed, along with 11 others, in February, 1917, when the ship struck a mine in the English Channel. When war was declared, there were more men in the Naval Reserves than required so many ended up fighting as infantry in the Royal Naval Division. Able Seaman Walter George Willmer was one such person. He was killed at the Battle of Arras in 1917. Shortly before midnight on July 9, 1917, at Scapa Flow, Scotland, HMS Vanguard suffered a series of explosions, causing her to sink, killing 843 of the 845 men aboard. One of those killed was Major Harry William Miles. In January, 1918, HMS Opal, was out on patrol with her sister ship, HMS Narborough, looking for German ships that may have been laying mines around the Scottish coast. Due to adverse weather conditions, both ships were ordered to return to Scapa Flow. Unfortunately, both ships ran aground and all but one of the crew were killed, including Able Seaman Alfred Young from Chichester. Shipwright 2nd Class Frank Rhodes was killed in September, 1918, aboard HMS Glatton. The ship was in Dover Harbour when an explosion occurred, causing a large fire on board. In order to protect other vessels in the harbour, the ship was deliberately sunk. In 1930, the remains of 58 sailors from this ship, including Frank Rhodes, were interred to a single grave in Gillingham cemetery with full naval honours. Stoker James Napoleon Timlick joined the Navy six months before the outbreak of war and started his career on HMS Victory in Portsmouth. After completing his training he worked on HMS Attentive, which served mainly as a patrol vessel in Dover Harbour but was one of the first ships attacked through aerial bombing in September, 1915, when supporting a naval bombardment in Ostend, Belgium. Two crew were killed and seven were injured. In 1917, James Timlick joined the Submarine Service, where he remained until 1928, before being discharged. He re-enlisted in 1929 and served during the Second World War, leaving the Navy for good in 1943. Despite the Armistice in November, 1918, there were further casualties. Telegraphist Sidney John Bridle died in January, 1919, from bronchial pneumonia and influenza. He had been on HMS Mersey stationed in the Mediterranean. 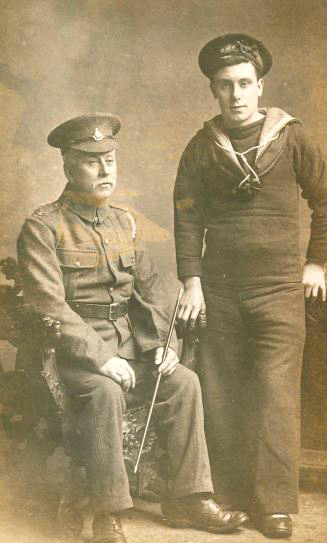 At home in Chichester, Leading Stoker Charles May, who had served on HMS Savage, died from the influenza. He is buried in Chichester’s Portfield Cemetery. Leading Stoker Harry Thomas Ayling drowned in an accident in July, 1920, while serving on the HMS Vampire. More than 45,000 Royal Navy personnel were killed during the First World War. After the war ended, the naval authorities and the Commonwealth War Graves Commission were determined to commemorate the naval personnel who had no grave. The Portsmouth War Memorial commemorates nearly 10,000 naval personnel of the First World War who were lost or buried at sea. Several men from Chichester are remembered on this memorial. Next week’s article will look at the soldiers from Chichester that took part in the First World War.